Inspired by the delicious Zucchini/courgette fritters with feta; Mucver, as we call it in Turkish, this time I made this wonderful dish using cauliflowers. Rather than frying, I baked the cauliflower florets flavored with feta, dill, onions in the oven. The result has been equally delicious and lighter in flavor, served with a refreshing wedge of lemon aside. Here comes baked cauliflower florets flavored with feta, dill, onions. Delicious with wedge of lemon aside. I love cauliflower’s firm texture and you can flavor it easily with herbs, olive oil and lemon juice. 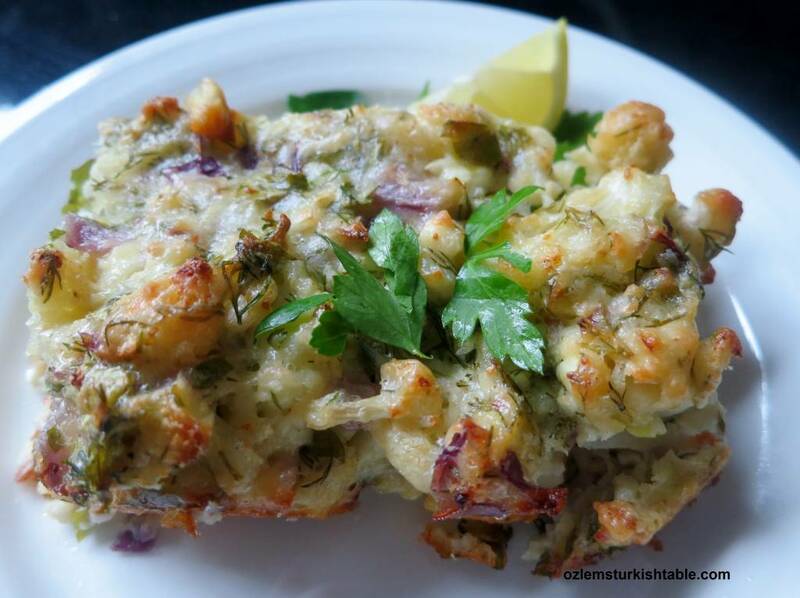 During our Culinary tour to Turkey a few years ago, we made the cauliflower fritters with feta and dill at our Aegean style cookery class in Sirince; they were scrumptious with garlic yoghurt aside. 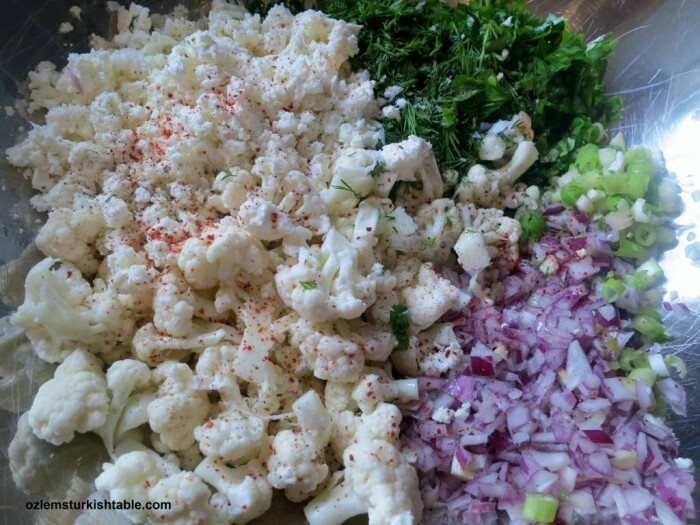 Stir in the chopped red onions, spring (green onions), parsley, dill, olive oil and the crumbled feta cheese to the bowl along with the cauliflower florets. I am happy to report that baking rather than frying works very well in this dish. It is easier, lighter and still packed with flavor. Dill, parsley, spring onions, red onions pack a punch and flavor the cauliflowers very nicely, along with feta cheese. You can add some red pepper flakes to the mixture for a pleasant heat, if you like. There’s also no need to cook the cauliflowers beforehand. You can serve this baked cauliflower florets with Cacik dip of yoghurt with cucumber and garlic or the Shepherd’s Salad; it would make a delicious lunch or light supper with crusty bread and wedge of lemon aside. 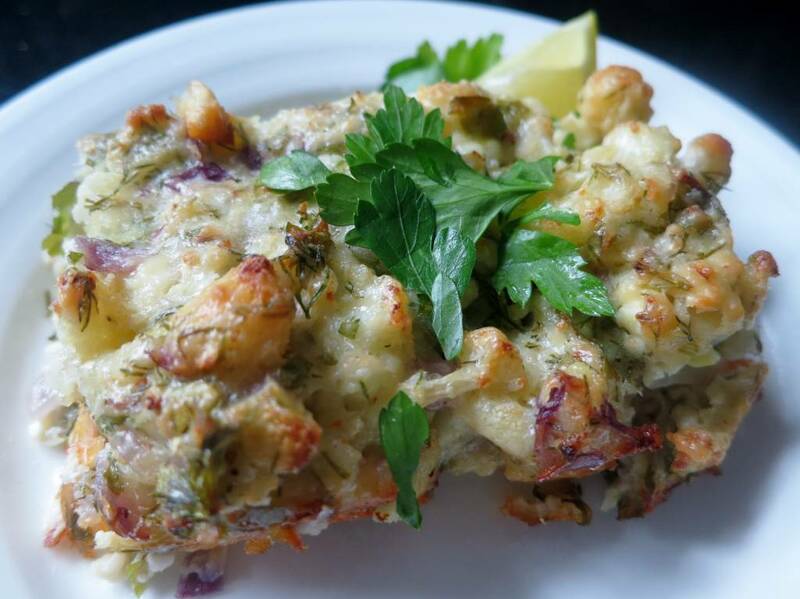 Baked Cauliflower with feta, dill, onions, Firinda Karnabahar Mucveri would also accompany grills well – delicious hot or cold. If you enjoy wonderful hot and cold mezes, vegetables cooked in olive oil like this dish and more, I have included a large variety of vegetarian courses in my cookery book, Ozlem’s Turkish Table, available to order at this link. An utterly delicious vegetarian Turkish appetizer, featuring cauliflowers, flavored with feta cheese, onions, dill, parsley. Baking works very well here, the result is a lovely, light vegetarian dish; delicious hot or cold. Cut the cauliflower in small florets, wash and drain the excess water in a colander/sieve. Beat the eggs in a small bowl. Place the drained cauliflower florets in a large mixing bowl. Stir in the chopped red onions, garlic, spring (green onions), parsley, dill, olive oil and the crumbled feta cheese to the bowl. Season with salt, ground black peppers and chili (red pepper flakes). Using your hands, combine all the ingredients. At this stage, you can check the seasoning – add more salt or peppers to your taste. Stir in the beaten egg and flour to the cauliflower mixture and combine well. Grease your baking dish with 15 ml/ 1 tbsp. olive oil and pour in the mixture to the baking dish. Bake in the preheated oven (180 C / 350 F) for 25 – 30 minutes, until the cauliflower florets have a nice light brown color on top. Slice and serve hot with a wedge of lemon and crusty bread aside. Cacik dip of yoghurt with diced cucumber and garlic or Shepherd’s salad with tomatoes, cucumbers and spring onion in lemon juice and olive oil dressing would go well with this delicious dish. 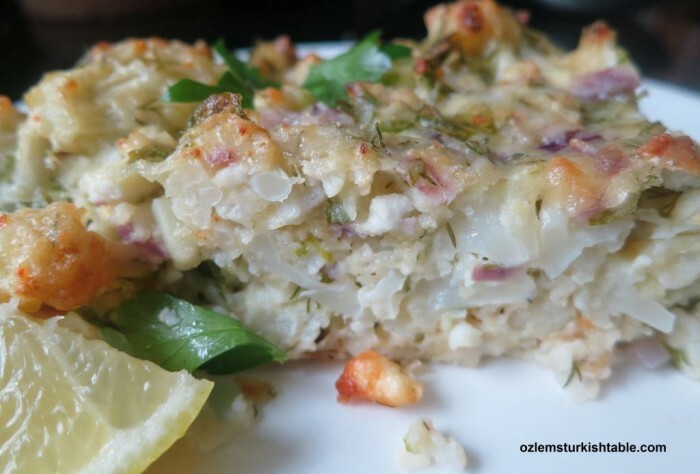 Lovely new way to cook cauliflower, Ozlem, baking it with cheese like feta would taste delicious. I’ve often found cauliflower is underrated vegetable. Have a great week. xxPeri. Mmm – this sounds great – I’m going to share it immediately with my daughter who has only just moved into a house with an oven. Hallo Ozlem, I have taken three of your cooking classes at CM in San Antonio. Absolutely love your recipes and have prepared delicious meals from many of them. Thank you so much. You make eating so healthy and so much fun. what a great recipe i can’t wait to try it! Just a note – you mention garlic in the ingredients but don’t include it in the recipe. Mmmm, love mücver and love experimenting with it. Never tried it with cauliflower though as we’re recent converts to this vegetable – 😉 – but will definitely give it a go. this a delicious dish and with variations is a great favourite in this house. 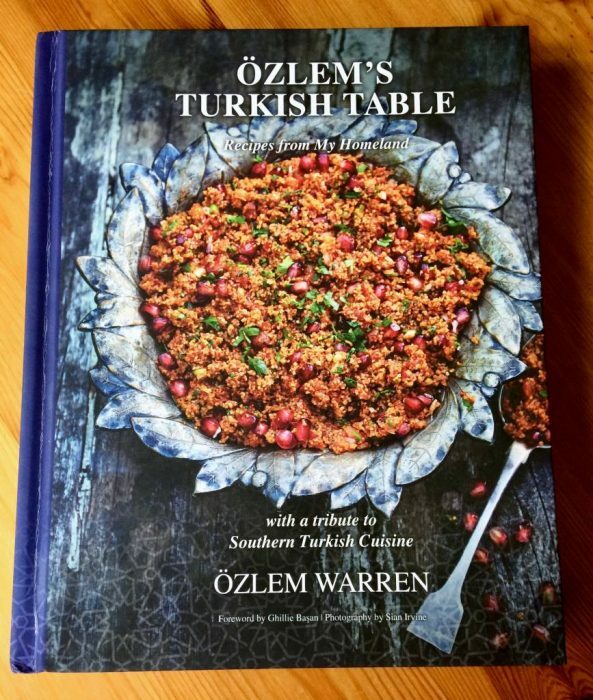 Ozlem, I’ve made several of your recipes — this one, a wonderful eggplant one, and a squash stew with ground meat… I absolutely love your recipes! I took a trip to Turkey two years ago and loved the food, and I found your website when I came back. I made this one tonight — I think my cauliflower was too big, but it still tastes great. Thank you for your website! Have you thought about a cookbook? thank you so much for this recipe, I have been doing other things with cauliflower but this one so far is my favorite. I didn’t add red onions, I didn’t have any! I doubled the spring onion instead. And I steamed the cauliflower since I was already boiling beans in a pot. It didn’t came out dry at all, it was perfect! this looks so lovely . what is the best kind of cheese to use here in Turkey.. I recently just moved here ..is it still called feta ?